...WHERE THE VISIBLE PATH IS NO MORE. God is so great- He gives us the sight to see And know right from wrong, and leaves the choice with us to make--Who Are We Going To Serve! Many people do not understand, or either have not been taught correctly about, or really have never heard of, Or just do not care enough about the processes involved in How Jesus changes us once we are saved, filled with His Spirit and we begin to carry our crosses and to deny ourselves. They stay too caught up in the many earthly issues-- skin color issues, gender issues, class issues, race issues, lgbt/straight issues, obtaining power issues, money issues, and of course the ever present, “I gotta have/ I need that no matter what” issues. And if you stay in line with these people, you will lose yourself in works governed by emotions and flesh that do not further the building of His Kingdom. Stand back and look at what the people around you place value in. Stuff or God? Are stuff, titles, and status valued higher than people and obeying God’s will in their lives? Is it like that for you? I’m not saying that all those topics and others are not important-but let us look at the truth about the issues. How do you really see God in your life? How do you really see Jesus and His Holy Spirit in your life? Does God want us fighting each other over ‘things’ and differences that He created? Does He really want us to place a high value on the people, and things that He blesses us with over His place in our lives? Isn’t that going the opposite way from What His Will and Purpose is for us all? 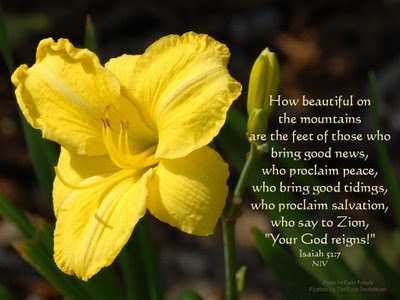 And many people really do not know What God has said, or what He wants from us, as they have only ‘joined in’ with groups of others who sound like they know what they are talking about. Their motives for fighting against changes and differences are based on what someone else said. They have never read the Bible for themselves, or, they are following old laws and ignoring the Law of The Spirit set in place by Jesus. They are not obeying God—they are obeying people. A large part of Working for Jesus is learning and using Spiritual discernment. Many times, I have to sit back and listen to see if people are coming in the name of church—or are they Coming in the name of Jesus. As many people are able to talk the talk—but when you look at their lives, their walk does not equal their talk. “7Do not be deceived and deluded and misled; God will not allow Himself to be sneered at (scorned, disdained, or mocked [a]by mere pretensions or professions, or by His precepts being set aside.) [He inevitably deludes himself who attempts to delude God.] For whatever a man sows, that and [b]that only is what he will reap. “11God has spoken once, twice have I heard this: that power belongs to God. For many believers And followers of Jesus, who have not grown deeply in His love and changes for their lives; it is easy to trust Him, to have faith in Him, to follow Him, when there is no sickness around, when there is enough money to pay the bills, to make repairs, and have fun. It is easy When your children are not under verbal or physical attacks from mean children, whose parents are not raising them but allowing them to Just grow up-it's easy when your children are not verbally or physically attacking other children because you are not being the parent they need but focusing on yourself. It is easy to believe when they have a job that is not in jeopardy of being taken away. It is easy to follow Jesus when they think that all they have to do is go to church once or twice a week, give some cash to the plate, sound like they fully trust God, and look like they are doing better than most. To maybe sit on a committee or two, to give some old clothes and canned foods to the church to distribute to those that do not have and are not able to provide for themselves, the daily necessities needed. And they believe they have done what is required to honor and glorify God through their lives. They always want to speak a list of what they have done to help God’s people. They think that is all there is to this Living for and With Jesus. They live on the surface of God. They do not know of the depth that He is. You know folks like that? They are quick to say, ‘I know God, I believe. I already know that, I already do that or I’ve done that.’ I think to myself when I hear them= Uh-huh, sure you do-sure you have. I have learned that I am not here to help everyone I cross paths with. But I am to learn from everyone I cross paths with. To tell the whole truth, they are sadly wrong on many points. They have both stopped learning, and growing because they received a little Word and Knowledge about God or they are just plain old fakers and liars. They do not want to learn nor do they want to really help God’s people past the feel good part of Working for Jesus. They have never been taken to the very edge where the visible path cannot be seen anymore. They have not willingly gone into the fire or stayed in the fire having been put there by God to burn off the dross and shallowness of flesh. To burn off the ego, the self part of us that we think knows everything there is to know. They have not ventured past their comfort zones. They do not really know what it means to suffer for His namesake! Lord Have Mercy! They really may not even have a relationship with God through Jesus—and if they do, truth be told, it does not seem to be so the way their talk does not equal their walk. It is easy when they do not obey God and walk the walk. We are given many opportunities to see God in His fullness—working for us and through us. There are many times where we will be standing on the very edge of a visible path and there is nothing that we can do to repair, to correct, to fix the situation. We have to rely and depend on God in the name of Jesus. You get to a point of growth in His Love where you Know that it is not by power, but by the Spirit of God that will move us through the barriers and the troubles that face us. He Always Has A Plan-He just does not always roll it out in details for us everytime. Truth be told, God has spoken this Truth about His Will and His Spirit in Zechariah 4:6. 6Then he said to me, This [addition of the bowl to the candlestick, causing it to yield a ceaseless supply of oil from the olive trees] is the word of the Lord to Zerubbabel, saying, Not by might, nor by power, but by My Spirit [of Whom the oil is a symbol], says the Lord of hosts. We had nothing to do with the creation of anything of God. Who are we to say that we can fix something or change someone? We did not make the tree grow seeds to replenish it year after year. We did not make the water stay at the edge of the land. We cannot bring life from death or touch the hearts of people and soften them to our side. We have done none of these, Nor can we do anything today by mere human power—trying to force something to happen that belongs to the Power of His Holy Spirit. And by His Spirit are we able to move through barriers, through oppositions, through trickery and manipulations, to get to the other side of a thing. Yes Lord, Thank You! It is by the Spirit of God that we live and move in Him that helps us in All that we believe and trust Him to do for us, and through us. Anything else is foolish thinking and will lead to self destruction. To place such a high value on things, and stuff, status, physical looks and fame, on money, on pleasing people—to make any and all of these your god is to live a life of trickery and manipulation. Busi-ness=Running in place and going nowhere—but wanting to convince people that you are working for God-that you are living the life of a true believer and follower of Jesus. God will create situations and circumstances in your life When you have to stand and use your voice-your presence to speak the Truth even when you stand alone and to do, is to live with integrity. To face yourself and tell yourself the Truth, that only God can help you is living a humbled, integrity filled life. A Spirit Filled Life. To Pray for and/or take up for others that are too weak to speak up, to weak and unlearned to take up for themselves in the midst of trickery, sickness, and any other lacking truth; to stand against the crowd of hate filled hearts and those that oppose Gods Will in your life knowing that the crowd may and can turn against you, is to live for and with Jesus by His Power. To Boldly, without shame, to obey God when He sends you To speak up and tell a friend the Truth about themselves or a situation concerning them is to carry your cross and follow Jesus, all the while knowing that this friend may run from what you say, or become cross at you for not agreeing with the lies they want to be their truth. To be God's servant and vessel is to go where He sends you without question or hesitation-it to do what He tells you to do without question and hesitation-to Allow His Spirit to Speak His Truth Through you without fear is to live for and with Jesus—to carry your cross—to suffer for His namesake. To do all this without knowing what the details are, not knowing where the next step will place us, not knowing what our speaking His messages will lead those that hear them to do. To not force anything, but to Wait and Expect Him to come and take care of us- is to show Him how much we love Him. 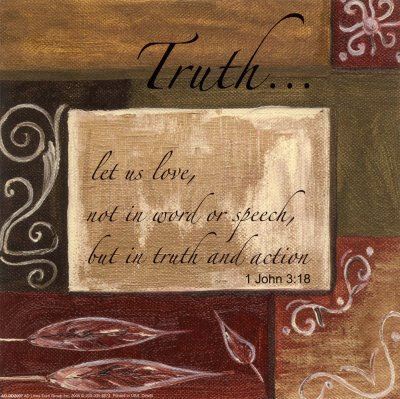 Let the Truth Be Told in the name of Jesus! or the name of church-i-ness? So many people want instant results to their problems and want their mistakes to disappear without any repercussions, without dealing with the consequences of making these mistakes—they don’t want to learn and grow. They do not live for the Truth-but for the appearance of the Truth. That is not the same thing. These same people run from Gods directions and Work but yet, they want to be involved in His Work so badly for appearance sake, that they group themselves with the wrong people—with the wrong motives. They choose ‘work’-what they see others doing- and say it is God’s work, when in fact that is not true. Are you trying to help some people that God did not send you to help? Be careful about your motives. Be careful about what and who you are making god in your life. Trouble loves trouble. We all know that saying, misery loves company. We have to watch out for traps that the enemy sets to draw us, lure us into the predicaments of others when we have no responsibility or desire from God to be involved. When you are living for and with Jesus-you are under the authority of His Spirit-His Will; and only when His Spirit gives you the unction to speak or act do we do so. We have to be aware and be careful of getting tangled up in situations where we have no Godly reason, no legitimate authority to take any actions at all. If you ask, He will give us discernment (and strengthen our discernment) to know the limits of our involvement-And we have to choose to stay within the confines and safety of our own boundaries set by Him. We must continue to eliminate ‘self’ as we Walk with Jesus on this Journey. Those that are not serious will fall away either by their own fears and doubts, or because God is separating them from us. Either way, let them go! To seek His Truth daily, about you and for your life can only be accomplished by the power of His Holy Spirit. The help of the Lord is our strength, our guide, our example, our secret place of safety. To spend time and study His life, to live IN His presence-to Worship Him-to Praise Him, to Obey Him is the fruit of a true believer And follower of Him. He always honors and rewards complete obedience to His Will and Purpose. Having faith that does not falter, even small faith is love to Him. As you stand on the very edge of the visible path, do you Trust God to Act Now on your behalf? Do you have the faith that so many before us not just had, but actively lived? Just think about how the lives of Moses, Joshua, Ruth, Hannah, Debra, Jeremiah, and Tabitha (Dorcas) would have turned out had they not had the faith and belief in God. They knew the Truth then, that Only God could and would help them, And Help them He did- every time! Amen! Let us learn from the examples that Jesus lived and taught to us, and from all the others that learned from Him And in turn lived; let us Pray the faith filled prayers, give the faithful and Joy filled praises, Then let us Wait And Expect our Father to Come See About us, as we stand at the very edge of the visible path. Don’t draw back because of doubts and fears after coming so far with Him—don’t stop and give up. Do you not realize just How Close you Are to breaking through the barriers set in place to trap and stop you, to crossing a bridge that He builds where there is no land, to walking through a door that He created out of nowhere? Do you know how many people stopped short; they just quit God not knowing they were just a few more steps from entering into Answered Prayers? God said to them He is with them, but they walked away thinking the price was too much to pay. Are you going to add to the numbers of those that almost made it, or are you going to add to God’s numbers of His faithful and trusting servants? Let The Truth Be Told in Jesus’ name, Amen. I just completed reading your post. I love it when thought provoking ideas are shared. I enjoyed what you were lead to share. It is good food after a long trying week. you know you are Always welcome here! it's a blessing to have someone to talk with good conversation. i'll be by to see you. i do visit your place and i like what you do there.